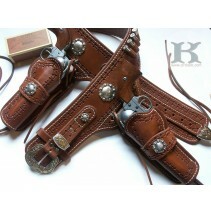 Custom Holsters and Western Style Gun Belts by Brett Park are fully guaranteed and dutifully created with pride. Guaranteed Satisfaction and Quality Workmanship using only Premium USA Vegetable Tanned Leather. Having a hard time finding a gun belt that fits? Maker Brett makes Women, Men, Youth in standard to hard to find extra large size gun belts and left handed holsters. No problem. 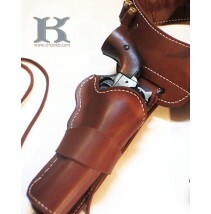 Holsters are made to fit single action, most double action and black powder revolvers. If you don't see your make and model listed in the drop down menu please inquire. You will enjoy your Circle KB gunleather for many years and will be able to pass it along as an heirloom with honor and pride. 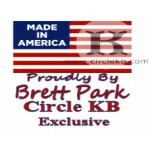 All Circle KB patterns are original, period correct western holster designs created by Brett Park, common in the 1800's and early 1900's meeting Single Action Shooting Society, Action Cowboy Shooting, Old West Re-enactment and World Gunspinners Association guidelines and regulations. We build what you want! Take advantage of us. Yes, you heard us! Maker Brett builds to order so you can take any holster or hunting gun belt you see and completely customize it. Don't worry, we won't let you do anything crazy or that won't function the way you envision it. A1 QuickDraw CrossDraw Western Holsters - The Gunslingers Choice! The A1 QuickDraw CrossDraw is a classic and traditiona.. The Circle KB Lone Ranger holster set is a reproduction rig of the Lone Ranger Gun rig worn by Clayton Moore in the po..
"The Ranger" Circle KB holster and gun belt is one of our most popular outfits. 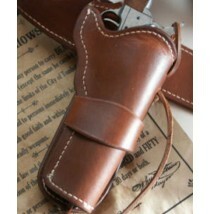 An authentic Ranger style holster .. 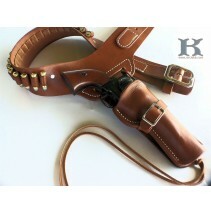 The Tumalo Kid features our extra wide 3.5" hand cut contoured to drop at the hip Gunfighter Buscadero Style Gun belt .. The A1 QuickDraw "Liberty" - a Hollywood gunfighters western style outfit.Holsters are hand cut and wet molded to fit yo..